The Hungry Cow: ValenWine 2008- Cheers to a Milestone! After months of planning and hard work, ValenWine 2008- NTU's (and Singapore's) first wine exhibition held by a university took place on 13th and 14th Feburary 2008. 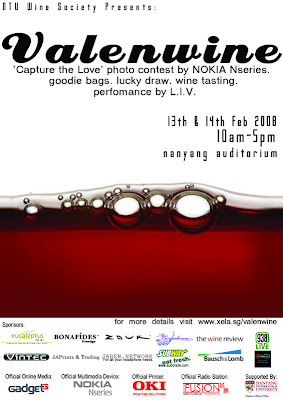 Held in Nanyang Auditorium and in conjunction with Valentine's Day, ValenWine 2008 aimed to provide a casual, inviting platform to spread wine culture and knowledge among the NTU population. It featured 14 wine merchants offering samples of their wines and sharing with the crowd their knowledge and experience. Visitors also got to purchase wines at discounted prices. Prof Lok Tat Seng, Dean of Students, graced the event as our Guest-of-Honour and officially opened ValenWine 2008. Here Prof Lok, together with some of his Student Affairs Office staff and the ValenWine organising committee, proposed a toast to the success of the event. Attracting about 2000 visitors, ValenWine saw a steady stream of visitors that ballooned during lunch period. Like a bottle of white among many reds, these Caucasian ladies certainly stood out. A big thanks to our international students and friends for supporting this event! The floor was buzzing with conversation, chatter (yes, there's a difference), laughter and interviews! Valerie from SCI and her friends were busy conducting interviews for their project. Here, they were interviewing Mrs Toh and Rekha, my guests from the Australian Trade Commission. All the best, girls! For me, Bottles & Bottles' Nicholas was a farmiliar sight as I frequent their Vivo City outlet which he runs. As pointed out by Cora, he has a twin who looks exactly like him! She happens to know Nic's twin brother. And Nic happends to be a primary school mate of an army friend of mine who in turn is JC buddy of Jun Yan, ValenWine's Vice-Chairperson. It felt like a life version of Friendster with 2nd and 3rd degree friends! Singapore is indeed small. Haha. And what better than an alumni to come back to his alma mater and support ValenWine! Hockhua Wine's William (far left in above photo), class of 2003, was overjoyed that such a wine event could take place on campus. Oh yes, wine is part of education. 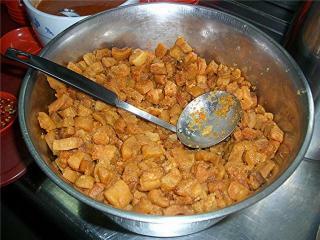 ;) And Hockhua offers more than bird's nests and ginseng. Clearly sweet wines have their sweet spot in the hearts of many, as witnessed by the throngs at LinkOp's booth. LinkOp's Geradine is seen here offering a sample of her extensive Greek dessert wines and educating visitors about Greece and her wines, which are available at Cold Storage and Carrefour. To entertain the crowd and to add love to the air, Little Island Voices lent their voices to the event. Nothing like plonking down on a chair with a glass of wine in one hand, while listening to their melodious tones. Such a luxury in a student's hectic life. There was also a Capture the Love Contest organised by Gadget3.com with sponsors Nokia and Oki. These 3 lucky couples each won a Nokia phone, with the victorious couple (3rd pair from left) each walking away with the latest N82 5-megapixel camera phone! Wilfred of PC Magazine Singapore and Darrell, Nokia Marketing Program Manager, are seen posing here at the extreme right with the winners. Check out more here. As usual the lucky draw draws in a crowd of eager hopefuls. One guy was clearly disappointed and didn't refrain from expressing it. Haha. But sometimes, one man's lost is another's gain. 10 fortunate winners also each walked away with earphones worth $79 each, sponsored by Jaben Network. Miss Confidance also sponsored accessories to 10 lucky winners. 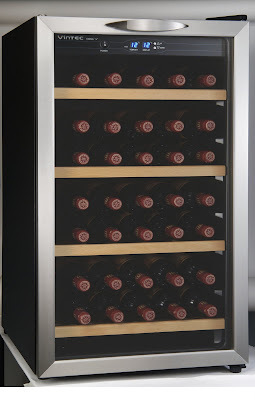 And the special draw featured a Vintec V30SGESS wine fridge worth $908, generously sponsored by Vintec. It was won by Kingsley Liew! Congrats and you lucky guy! This sleek, stainless steel wine fridge has a capacity to store 30 bottles, slideable shelves and comes with cool blue LED light display! I'm jealous. So cheers to ValenWine 2008! It was a success and a good learning experience for me as part of the organising committee. I had fun! Good, educational, self-improving fun. I hope more such wine events would tackle the undergraduates- the soon-to-be market and consumers, if they are already not. - Tommy Lam & Mrs Lam of Wine Academy of Singapore & Cafe de Amigo for rental of glassware. - Mrs Toh, Rekha and their team from the Australian Trade Commission for visiting ValenWine and supporting the wine merchants who are dealing with Australian wines. - Melvin of Cold Storage Group for visiting ValenWine and exploring future events. - Masadi and Decwel of APS Lifestlye Marketing for visitng ValenWine and sponosring the cool Vintec wine fridge. - Wilson of Jaben Network for sponsoring cash for the printing of fliers and for the earphones as lucky draw prizes. - Mageline of Mediacorp Radio's 938LIVE for sponsoring pens for the goodie bag. - Andre of JAPrintz & Trading for printing of banners and sourcing of sponsorships. - Chin Liang of Bottles & Bottles for partnering us as a wine merchant. - Alex of Wine Cellars for partnering us as a wine merchant. - Andy & Gopi of Garnet & Peridot for partnering us as a wine merchant. - William of Hockhua Wines for partnering us as a wine merchant. - Roy of Potters Clay Vineyards for partnering us as a wine merchant. - Weisong of Casa Chile for partnering us as a wine merchant and sponsoring wines for the blind tasting game as well as lucky draw prizes, vouchers and brochures for goodie bags. - Julie of Austral Vintners for partnering us as a wine merchant and sponsoring wines as lucky draw prizes. Phew! This would never make it as a thank you speech at the Oscar's. But still thank you, thank you, thank you. PS: On a more personal note, I am grateful for having met and worked with the above mentioned people and in addition, Palitalia's Gary & Julia though I just got introduced to them at ValenWine itself. I certainly look forward to future collaborations with them. wow! its so cool! u are the business manager? what company is it? hahaha! so u all are sort of a event organiser? Lucky NTU!!! NUS should have something like that..... jealous jealous....Cheers! ladyironchef: Haha. Yea, it was a fantastic experience! No la, not a business or company...at least not now. We were the organisers. bottomless pit: It was the first for any local uni and a lot of work! Haha. Btw heard NUS trying to revive a gourmet club. Maybe you should give them a hand and organise such events!